Summer is in full swing, and fun comes with the hot sun. Pittsburgh is lucky to have plenty of options for cooling off. The Steel City can offer everything from lazy lakeside chilling to rafting on the river. Rivertowne Brewing Co. is happy to help with your summer outings and get-togethers. The Dock Party is the new 12 pack of 4 different summer-themed IPA’s. It’s the perfect combo for hot days out on the water, relaxing with friends. Be the captain of your next dock party and have Rivertowne brews tag along with you. Here are just a few favorite rivers and lakes near Pittsburgh. Jump! IPA for Making Waves at Lake Arthur – Moraine State Park is home to laid back beaches and fishing spots. In Butler County north of Pittsburgh, the park is around 45 minutes away from downtown. Lake Arthur is the recreational lake on site that offers the perfect sailing scene. Power boats and pontoons are great for the easy-going waters and beautiful greenery. Lake Arthur activities are ideal for enjoying Rivertowne Dock Party’s Jump! IPA. This flavor combination of summer stone fruits, berries, and tropical notes of mango also has underlying tastes of grass and resin. It’s the perfect IPA for your boat-side jumps and sunny swims. Jump! IPA is 6.1% ABV, 80 IBU. Class V IPA for Treading through Keystone Lake – Class V rapids are no joke to kayakers and rafters. Class V IPA by Rivertowne is kicking with hop flavors twisted in citrus and pine that is perfect for a lively experience. Having Class V IPA in the Rivertowne Dock Party means having a crisp companion for fun on Keystone Lake. 1 hour Northeast of Pittsburgh, Keystone Lake is a popular getaway for camping or weekends on the water with canoes and small motor boats. Rivertowne Brewing Co.’s Class V IPA is 8.2% ABV, 60 IBU. Float Trip IPA for Stress-free Drifting on the Clarion River – Clarion River has a 115-mile track of valleys and beautiful trails. There are different sections of river that hold activities for every thrill chaser or lazy river floater. Near the Cook’s Forest area, a 2-hour drive from Pittsburgh, tubing is a local favorite. Rivertowne’s Float Trip IPA is an appropriate addition to your floating cooler. Have a lazy day of drifting down the river in inner-tubes, party floats, or rafts. This pale ale is hop-forward and is flavored with a tropical variety for a well-balanced, but bitter finish. It pairs well with summer breezes and that one friend in your group who isn’t the biggest IPA fan. Float Trip IPA is 5.2% ABV, 30 IBU. Hazy Morning IPA for a Refreshing Day in the Raystown Lake Region – Hazy Morning IPA is for anyone looking for a stimulating New-England style IPA that has snappy, fresh flavors of green hops and citrus aromas of grapefruits. In the Raystown Lake Region, 2 hours West of Pittsburgh, there is a collection of campgrounds and marinas that are an ideal get-away in forested lake shores. With kayaking and boat launches all summer, Hazy Morning IPA is going to be your go-to from Rivertowne’s Dock Party. Hazy Morning IPA is 6.7% ABV, 36 IBU. 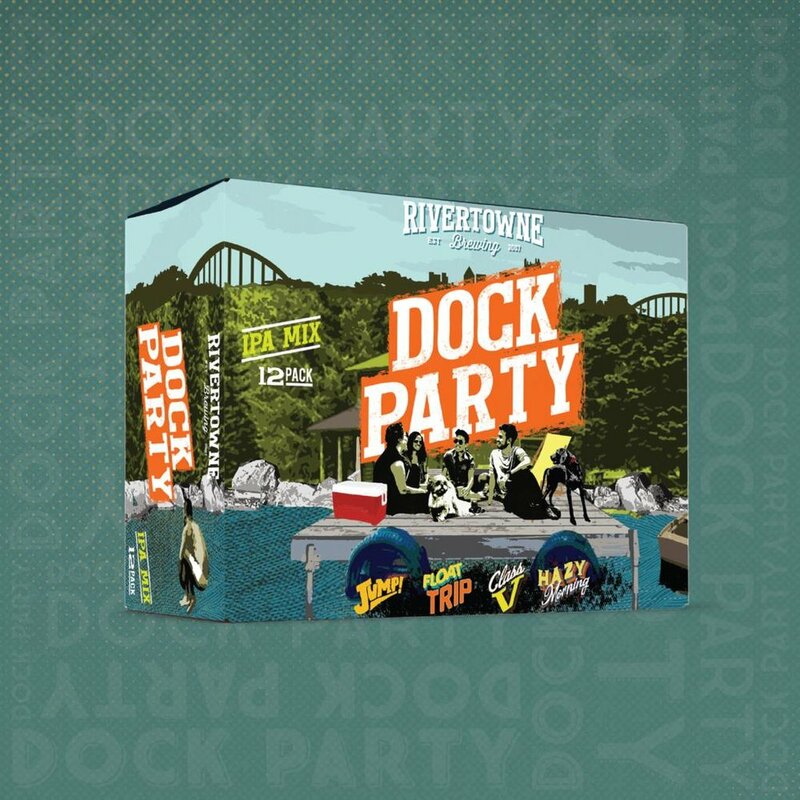 You can grab Rivertowne Brewing Co.’s Dock Party IPA Mix Pack can now be found at your favorite local beer retailer! They are bound to be your next summer favorites along with some of the other Rivertowne brews like Hala Kahiki, Grateful White, and EZ Lager. Keep an eye out for the rebranded cans sporting new designs that celebrate the spirit of loving the outdoors in Pittsburgh. Cold ones in the sun with some friends is always a great time. But remember, no matter what lake or river you choose to enjoy some local brews on, have fun responsibly. Boating under the influence is illegal and a bad idea.